The burin consists of a rounded handle shaped like a mushroom, and a tempered steel shaft, coming from the handle at an angle, and ending in a very sharp cutting face. An engraving burin is used predominantly by intaglio engravers, but also by relief printmakers in making wood engravings. Its older English name, still often used, is graver. Usually an engraver will have several tools, of different sizes and shapes of cutting face. It is held at approximately a 30-degree angle to the surface. The index and middle finger guides the shaft, while the handle is cradled in the palm. 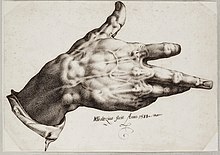 The 16th-century Flemish engraver Hendrik Goltzius is known for using this tool as his malformed hand was ideally suited for the cradling and guiding of a burin. ^ Alexia Rostow. "Porcuprints-Printmaking". Retrieved 2011-08-06. This page was last edited on 3 March 2019, at 21:04 (UTC).